Consider building your new custom Media Center/HTPC in our stylish Apevia X-MASTER case. This ATX PC case can be positioned horizontally as a tower, or vertically as a desktop in order to conform with your available space. Its brushed aluminum front panel harmonizes with most of today's home theater systems. 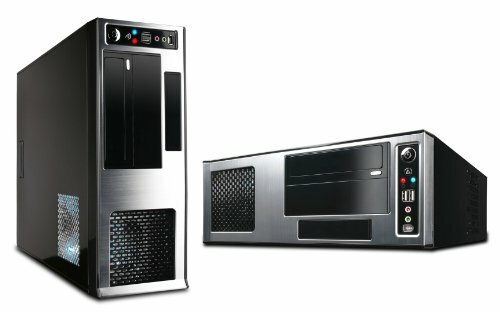 Its optimal cooling capacity (up to 4 fans) provides the best cooling solution amongst desktop and Media Center/HTPC cases. It can accommodate standard ATX / Micro ATX motherboards, and standard ATX power supplies. The installed 500W power supply is more than enough to handle all your system needs. 3 color choices:black, blue and silver. Dimensions(DxWxH): 17.7" x 14.5" x 5.5"